Item is a reprint of Angus MacKay's 1838 publication "A Collection of Ancient Piobaireachd or Highland Music." Item is a book of music containing strathspeys and reels for the violin, as well as for the violoncello and harpsichord. Item is a photocopy of a book of music containing strathspeys, reels, and jiggs for the violin, as well as the violoncello and harpsichord. Item is a thesis titled "A Linguistic Study of the Lake Ainslie Area of Inverness County, Nova Scotia," written by Nora Alice Rowe. The thesis provides an analysis of linguistic particularities in the Lake Ainslie area. Item is a book of music containing a Gaelic songs. Item is a book of compiled sheet music for various forms of Scottish dance. Item is a book of compiled sheet music for the violin. Item is a newsletter published by the Gaelic Society of Toronto. 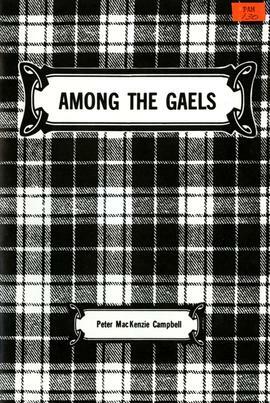 Item is an account of the Gaelic Society of Cape Breton's tour of Scotland in 1974. Item is a book of original songs and music. Item is part of a concert program, featuring the biographies and selected works of Dr. Gearóid Stockman and Brian Ó Maoileoin. Item is a book of music containing 463 original tunes for the fiddle by 120 composers from across Canada. 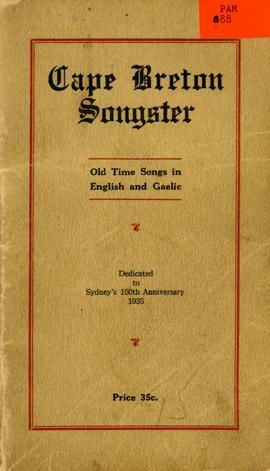 Item is a song book, including both English and Gaelic traditional and folk songs, in honour of the 150th anniversary of Sydney, N.S. Item is a song book of traditional English and Gaelic folk songs. Item is a thesis titled "Cape Bretoners in Windsor: A Folk Society in an Urban Setting," written by Sheldon MacInnes. The thesis studies rural Cape Bretoners transplanted to Windsor, Ont. Item is an article describing the characteristics particular to Gaelic poetry and music. Item is a book of music containing jigs, reels, hornpipes, and breakdowns for violin and piano.